Marriott Bonvoy has teamed up with the Football Aid charity to give you a chance to play a full game at some of the most illustrious grounds in the UK, with one special option in Europe. Football Aid runs regular charity games at famous grounds, with all positions up for grabs. Ex professional players and managers are often involved to play or coach on the day. If you’re in good enough shape, this is a fantastic opportunity. Packages let ONE person play, but a second person can come along and join the buffet afterwards. You will also get multiple guest passes to watch the match. You also usually receive a fully personalised official replica kit, get pre- and post-match briefings and a post-match awards presentation and receive a team photo and a DVD of the game. Registration for the current IHG Rewards Club promotion “Reward Nights. Faster” was meant to end on 15th March. This was a bit of a surprise, because the promo is still valid for stays until 30th April. Whilst Marriott Bonvoy is well known for closing registration 4-6 weeks before the end of a promotion, IHG Rewards Club has NEVER done this before. It makes sense, to be honest. It’s not as if your average business traveller has full visibility of their schedule for the next six weeks – I certainly don’t. Why would IHG want to lose out on short notice stays because the traveller could no longer sign up for a bonus? IHG appears to have had a rethink. The website for “Reward Nights. Faster” now says that registration will remain open until the last day you can stay, which is 30th April. Click here to register. Sign up if you think there is a chance that you might have an InterContinental / Crowne Plaza / Holiday Inn / Indigo etc stay in the next four weeks. 8,000 bonus points for four stays booked on the corporate rate of the company I haven’t worked for since 2011! So far I have triggered the 19,200 points bonus for staying at three different brands. I also got the 3,000 points for a February stay. If the chance comes up to squeeze in another two nights then I will trigger another 10,000 bonus points worth £40, although I don’t see that happening at the moment. Take a look at what you’ve been offered. The registration link is here where you will also find your personalised targets. Stays must be completed by 30th April. If you work in the City you are probably familiar with Grange Hotels, which has some prime sites and was one of the first groups to open hotels in the area. 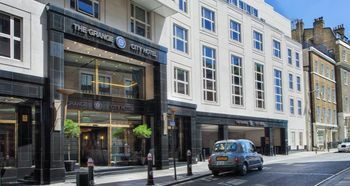 Four of the Grange Hotels sites – Grange Tower Bridge, Grange St Paul’s, Grange City and Grange Holborn, with 1300 rooms in total – have been sold to Israeli group Fattal. Fattal already owns Jurys Inn and the Leonardo Hotels brands. Leonardo took over one of the Heathrow Holiday Inn sites a couple of years ago. It also owns the Grand Harbour hotel in Southampton and the iconic Midland Hotel in Manchester. Grange Tower Bridge, St Pauls’s and City will be rebranded as ‘Leonardo Royal’ whilst Holborn will be the first UK hotel under the ‘Nyx by Leonardo’ brand. You can earn 500 Lufthansa Miles & More miles per stay at Leonardo Hotels but that is the only airline deal they have. Details of how to get Miles & More miles can be found on the website here. How Santiago shows up the crazy disparities in Avios pricing - with taxes from £42 to £604! Can virgin flying club miles be transferred from one person to another? I have a colleague who has no need for their 20k miles, and glad to gift them to me. If they log into their FC account and uses the transfer miles function there is a drop down menu showing the cost. There is a section in flying club called something like ‘buy, gift, transfer miles’. OT: have to return a Hackett item bought in store. (bought 4 items, need to return 1) Any idea how procedure works? Do I present the card in store? Will I lose all my avios or just pro-rata? I’ve had to return something on line as wrong size. I should think you will lose pro rataI can’t reorder until it’s back thru their system and then hopefully offer put back on my card. If not I will just call Amex. Surely you will have to present card you bought with to get money refunded back on card. If in doubt call Amex. Code still doesn’t work though. I have availed of this or a similar offer before on a different Amex MR point card in the past. Would this perhaps be what is stopping it going through? Always used to work on new cards on old Amazon accounts, or the same card on more than one Amazon account. Maybe they’ve tightened it up? Won’t work for me either and I’ve not used it in the past. Have made sure that all items in basket are sold and shipped by Amazon.co.uk. CS chat says all 8,400 have been used up. I pressed them on it so they ‘went to check with a supervisor’ and came back and said the same thing. Its just lies, pure and simple. They simply refuse to accept that there is a fundamental issue with the code when they changed it before Christmas. The offer was extended today yet all the codes have been used? Highly unlikely. Press them and don’t give in!! O/T – Did anyone else redeem Skywards Miles for FA Cup tickets this coming weekend? I know for Tennis I had to go to London Emirates office directly and collect them so maybe contact them? As did I. Annoyingly I didn’t get a business card from the Emirates marketing person who I met on the day. Wow that sounds like quite a PITA having to go to their offices to collect tickets! Not really, it is only about a mile from Queen’s Club and both are directly outside tube stations! Not that I’m planning to use one of their deals it does just seem a bit of a bonkers way of them running things. You will get an email 48 hours prior to the game informing you where to collect the tickets on the day. Surprised they haven’t give you seat numbers yet. Perhaps Emirates don’t know themselves which seats have been allocated yet. I’ve managed to pick up a contact name from a similar redemption at the Emirates for an Arsenal game. OT Hilton – does anyone know if you are a diamond and went down to gold today, do hotels still offer entry into lounges if booking was made while a diamond with the stay next week for example? Thanks. I assume it’s the status you have when checking in. You’d be upset of you booked when gold but subsequently achieved diamond and they did not recognise it, so I assume the opposite must also occur. Thanks for mentioning though as I’ve been bumped down to silver when should be gold. I’ll chase if not sorted in a couple of days. No, but if the hotel does not refresh its data it may still see you as Diamond. Does the Hilton downgrades all happen on April 1st or does it take a few days ? Mine hasn’t changed – have I got lucky ?! +1 TGLoyalty pushed through the spend on the Hilton Barclaycard but downgraded to silver. I have amex platinum at the moment though so will push it back up through that. @Sussex Bantam, you may be lucky. I was gifted an extra year as diamond last year, I assume by mistake as I didn’t meet the challenge nights in 2017. My dad has been downgraded despite spending the 10k on his Hilton credit card. Is that relationship over? Not as far as I know. It is £10k per calendar year and not card year though (isn’t it?). Excellent news, thank you. Shame I haven’t got much in my account! I had given up hope and transferred it out already. OT. Back in Feb, @Craig recommended the 3 monkeys in Ubud. Just went there tonight and food was awesome. So thanks a lot for that tip. Ibu Rai tomorrow. Thank you! Will be there in May and will seek it out. You’re welcome, glad it was good. It’s the most traffic choked, artificial place we went to over 3 months in Southeast Asia. I’m told it used to be good before the Eat Pray Love crowd descended. I personally can’t stand the old tourist dancing shows and false culture – but each to their own – guess also why I detested Kuta! Glad I never went to Ubud then, not as if it’s Toledo. My partner and I spent good four days in Ubud last year. Everything depends on you – what you choose from what’s on offer. The best line in all comments here was “Each to their own”. Should be a full stop after that. You won’t be disappointed, Toledo is one of Europe’s jewels. Totally agree. Ubud in 2017 was the least enjoyable part of Bali. Couldn’t see what the fuss was about – tourism on steroids whilst avoiding the traffic a d coach parties. Some very beautiful hotels away from the town however. And temples…re Kota, we found a gem of a place in Tuban, return every year. Rama beach and villas. Very reasonable for long stays. Lovely local eats. Yes we were very pleased to have chosen to stay a short drive out. We had a lovely villa with private pool at the Sankara resort for only about £130 a night (and paid for with Hotels.com credits). Site we don’t mention offering 25% bonus transfer to BAEC Avios until 30th April 2019.
how does that work – it’s quoting me a cash payout, not Avios? does it convert the Cash in to Avios at any point? Thank you both. Is 25% bonus good value? It’s better than no bonus.. Depends what you value an Avios at. You can do the sum yourself – it’s literally given to you on the payout page. Register your BAEC No against your profile and choose ut as your payout option. OT: Can anyone confirm whether Revolut top ups from Creation or Barclaycard are treated as purchases or cash advances? New to this. Creation IHG card is a purchase. They count as purchases, but I can only top up £250-200 every other day, before it get blocked. OT- Virgin Atlantic credit card. If I close account can I sign up at a later date and still get bonus. If that isn’t an options for the basic card would it work for the paid card?? You can hold both cards at the same time. And get 2 bonuses. Others have churned same Virgin card successfully, 2 year cycle definitely though some dude said he managed it after 6 months. Dude..? Have you gone all 1970’s “street” on us Harry? How can you know there is a 2 year cycle on Virgin when the cards are 11 months old?! This is totally at the decision of Virgin Money compared to what MBNA used to do, Virgin Atlantic has absolutely nothing to do with it and no reason why the two should have similar policies. A lot of finance companies silo their records after a few years. Although I heard First Direct refused someone a current account switch bonus rejoining after 18 years! Earn 70,000 total bonus points. Stay at 3 brands and get 14,400 bonus points. Stay 2 weekend(s), including a Saturday night and another night, and earn 5,600 bonus points. Stay at 3 IHG® hotel(s) and earn 8,400 bonus points. Earn 6,600 bonus points when you book 2 Bonus Points Package stay(s) and get to your next reward faster. Complete 4 of the 4 offers and earn (an additional) 35,000 bonus points. Therefore we will hit all four targets + bonus + actual points for stay + welcome amenity + card spend points. With the total cost of bookings at ca 350 pounds, we should have around 0.4p per point which is in line with Rob’s valuation. I personally would not consider buying points for their valuation. Unless you have a short term redemption in mind. They will in time be devalued. But he’s also stayed at the hotels and enjoyed the breaks by the sounds of it. I’d much rather do that while earning a shed load of points than a mattress run. Thanks @TGLoyalty – this is exactly the point which I have been trying to highlight: you can combine points runs with spending nice time even in seemingly unpleasant London suburbs.